I'm having some trouble with this. 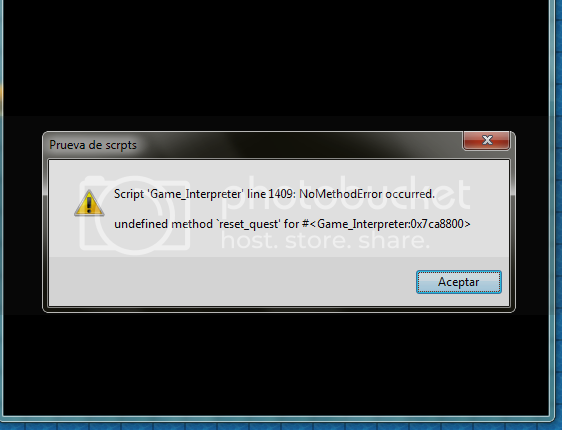 The script looks wonderful, but when I open up my project I get the error "Script 'Quest Journal Insturctions' line 3: SyntaxError occurred. How can I fix this? Also, would it be possible to use this with a ring menu script and if you don't mind me asking, how exactly could that be done? Edit: Nevermind, fixed it! Getting this script to work with this ring menu script (http://www.rpgmakervxace.net/topic/1836-ring-menu-vxace/page__hl__%2Bring+%2Bmenu) would be really great though if anyone knows how. Edit: Turns out their compatible! Nevermind. First off, thanks for the great script. But I have a slight problem. I have made a custom category called "Notes" and included a quest in it, but the quest is also appearing in "Active" category. Is there any way to uninclude a quest in category. In the main post, it is line 807, but it may be different for you depending on your configuration. @talias - sorry, there isn't. No, I meant everything after those lines. All I am saying is that if you have done any configuration on the script, you don't need to do it all over. You only need to replace everything after the identified lines and can keep all the configuration intact. Not able to test since I am not at my computer, but does it not work just to put the Quest Journal under Yanfly's script in the Script Editor (keeping in mind that you also would have had to set MENU_ACCESS to true at line 238 and chosen an index at line 240)? If you can't think of a way for Menu Engine Ace to incorporate your scripts I'll just keep trying to find a workaround. Thanks for your time though. I found a workaround, it involved me making a fake instance in Yanfly's script but not allowing the instance to actually show on the menu as a command. This for some reason moved the Save / Load command and the Exit Game commands to the bottom. Its weird and I'm hoping this doesn't lead to strange errors later. Hm, well I'm glad it's fixed for you. I just tried the two scripts together and it worked fine; I wasn't able to reproduce the problem. Any chance that you could do me a favour and make a new game with the initial error reproduced? I'd like to see what was going wrong so that I could fix it for other users. How exactly did you go about doing this? I'm trying to call this script with yanflies as well. I have gotten the Quest Journal icon itself to appear, but upon clicking it my games crashes. And here's where I created the journal inside the menu commands. Please, any help? I might be using the wrong scene perhaps? As long as the Quest Journal is below YEA Menu Engine, you shouldn't need to edit anything in either script. It ought to be added to the menu automatically, and whenever I've tested it that is exactly what happens. I uploaded a project where I just pasted the two scripts into the same project, without editing anything at all, and it works fine. Anyway, obviously it's a real problem, so could you please create a project with that error and share it so that I can see what is going wrong? I'd like to be able to fix this error. Yes, but I am using a "Ring" menu system Since I do not use all of the menu options and im making a "Horror" game not a RPG I needed a simpler menu, when I put both scripts together (yours below yafles) the icon for the script does not appear. This is why I tried to create my own method. This method setup I am using makes the icon appear, however when selected the whole game itself crashes/freezes. I'd need to see the ring menu script itself. All I needed to do was name a picture "Quests Icon" and it worked without any modifications to any script. A demo is attached. It works on my end, only problem is there are empty icon spaces next to the options on the title menu and other stuff like that. I have it setup like in the demo, I also use other menu editing scripts like yafle's status and item menu screens. Any idea if those could interfere? It might be possible. Try adding your other scripts into the working demo one by one and tell me when you hit a snag. Then upload that demo and tell me which script was the last that you added. @Wiimeiser - that would happen whether you use the Quest Journal or not. If it's an error, it's an error inherent to YEA Menu. I implemented all my scripts into your demo, and it still works, what possibly could be the problem? EDIT: Would you mine actually taking a peak at the demo and giving me your thoughts? Might it be that you are still using the version of YEA Menu Engine that you had tried to edit? Try replacing it with a fresh copy. If that doesn't work, then I could take a look at your project - just upload it. I coudln't get it, I pm'd you a demo. :/ Sorry. Is there a way to change the color of the blue lines? Could I hide categories until a quest from that category is unlocked? Could I add more to the description of a quest through a script call or by flipping a switch or variable?